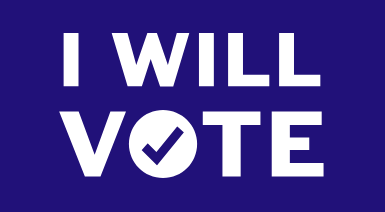 Illinois High School Democrats (ILHSD) is a political organization that serves as an entry point to Democratic politics for youth activists from across the state. Hundreds of our members work to advance the ideals of the Democratic Party, engage fellow students to become active within the local and national political system, and elect Democratic candidates to public office. With our vast network of resources and chapters, we aim to provide a powerful and collective voice for politically-active high school students. ILHSD is entirely student run and dedicated members from all walks of life have the chance to open new doors through their involvement in projects and events. "High School Democrats has given me a platform to speak up about what I believe in, access to elected officials across the country, and most importantly, a network of driven and passionate high schoolers fighting to make a change alongside of me"
commit to vote this November. ​it matters now more than ever.